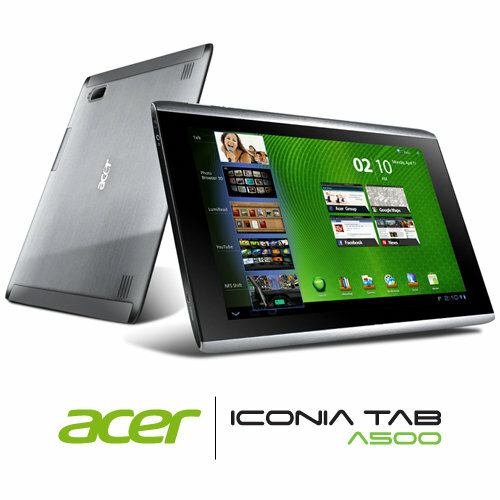 Acer Iconia Tab A500 uses Nvidia Tegra 2 1GHz dual-core processor, they both weigh exactly 730g and both have a 10.1-inch touch screen. The list goes on: both devices have 32GB of internal memory, 1GB of RAM and support microSD cards up to 64GB. Every blog and magazine are filled with lots of negatives about each tablet they review. After reading all the negative vibes, I was paranoid about buying an Android tablet, so I decided to wait. 1. Internal memory and processor (even) One GigaByte is twice as much than iPad’s (better multi-tasking) and on par with the more expensive Xoom. 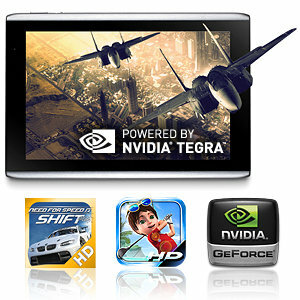 1GHz NVIDIA Tegra 2 (2 x Cortex A9) is on the part with Xoom, clock speed similar with iPad 2. 2. STORAGE (even) 16 GB, same as iPad 2 but Xoom comes with 32GB. Both are expandable through microSD. 3. WEIGHT and DISPLAY (even) they are both slightly heavier than the iPad or the Xoom but only slightly. Both come with 10.1″, 16×9 wide screen; they both beat the iPad’s 9.7″ screen which is in a 4×3 format. Apples have a few more square inches, but movies show much better on a 16×9 screen. The viewing angle is quite wide with few distortions, and the colors are rich and bright when used in a room under natural or artificial light. Outside, the glare is significant. 4. Transformer Price with everything else more or less equal, the Asus tablet beats the Acer Iconia Tab A500 by $50. It can be argued that the Iconia has some advantages – I like its solid aluminum backside – but the Transformer has its own so, on a Dollar vs. Dollar competition, the Transformer wins. They each comes with options and expansions but, unlike cars, You can get a lot off the base models. 1280×800 on both the Transformer and the ‘Acer Iconia Tab A500’ translate in 30% more pixels than iPad’s and a few more pixels per square inch. they both come with 5MP rear camera for picture or video-taking, but the Iconia has a 2MP front facing vs. the Transformer’s 1. 2MP. In addition, the Iconia has a flash which the Transformer lacks. Ionia’s pictures appeared a little crisper to me. Transformer’s plastic back is not a major concern to me, but Iconia’s solid aluminum armor makes it the clear winner in this category. The Iconia feels like a solid, well-designed product. I’ve never had the honeycomb crash on me. I surf the web, get my gmail, get my Outlook mail, IM, buy apps, play games, check the weather, read books, and it’s a blast. Are you ready for serious gaming? Acer Iconia Tab A500 is the first mobile device to bring an arcade-like gaming experience with 10 point multi-touch control for high-level gaming that’s on par with the best game consoles. And with preloaded full versions of top games like Electronic Arts ‘Need for Speed: SHIFT’ and Gameloft ‘Let’s Golf’, let the fun begin immediately! The screen quality is great, and I love the motion backgrounds. Wireless speed is fine, 32GB is plenty, and I’m glad to have the USB port for future options. Overall, I really like this Acer Iconia Tab A500. I had a G1 when it first came out, and it was pretty much a mess when at the beginning. You will find numerous things to consider when organizing your family room furniture. Regardless of whether you have recently purchased a discount family room furniture set, and have opted for couple of pieces individually, we have got a listing from the some tips when organizing your family room. Space One of the leading things to consider when organizing your furnishings are the quantity of space you’ve. For those who have a little space you need to limit the quantity of unnecessary products you’ve and select products that are multi-functional. For example, sofa beds are a good idea if you don’t possess a spare bed room and will also be getting visitors remaining along with you. An ottoman is yet another great item you could have that takes up little room, but when you purchase the correct one, can be used an additional chair, an espresso table or even a small space to keep things. For those who have a sizable space to fill, you don’t need to bother with size a lot. Large a coffee table and enormous lounges might help fill areas without cluttering. Lifestyle Your way of life can also be something you require to think about when organizing your furniture. You might work at home for example and like employed in the living room so you should possess the computer along with a desk integrated into the area. You might entertain people a great deal, therefore the living room area needs plenty of seating. For those who have young children you a lot wish to make certain all your furnishings have soft corners and sharp edges are from where anybody might bump their heads. An area rug is another welcome addition to some living room and may add colour, function as a feature, or just safeguard carpeting from grubby ft. Distance between furniture Your furniture ought to be arranged in a way to ensure that it doesn’t appear cluttered. Take care not to over-do the quantity of furniture you’re investing in one space. Chairs ought to be stored from walls and there must be a great distance involving the table and lounge setting. It’s also best to make certain your couch isn’t too near to the television. Chaise patio chairs are ideal for comfort and additional seating, just make certain they do not stand out too much inside a narrow area because this may block individuals from having the ability to walk freely round the room. For those who have a far more open plan space to utilize and wish to divide up just a little, a lounge is a superb furniture piece to segment an area. Lighting Consider where your natural and artificial light sources come in the area. You will need a source of light close to the sitting area. Lamps are wonderful to produce soft lighting. Test out the lights off during the night, in which the light light looks best. Home windows are a good feature to your rooms so work your furniture to make certain your window is utilized. Organizing family room furniture could be tricky. I really hope some suggestions have assisted you choose on how to set up your family room furniture that meets your way of life and produces the appearance you would like. HP Pavilion G6-1B60US Charcoal Gray is one of the most popular laptops at this time. I believe this is an excellent value for a person who wants a notebook to do more than just chatting, web browsing, email, and word processing. HP Pavilion G6 is fast because the AMD dual core works very well with this laptop and has adequate memory to work with video and music. We have been impressed with the screen resolution, weight and the keyboard has a good feel; the large off-center touch pad makes a lot of sense for us to operate a mouse with their right hand. 2. Unchanging fan noise can be quite noticeable in quiet areas or on hard exteriors. 1. Ergonomics notebook with solid keyboard feel, bright display and well placed touchpad. The system is reasonably fast for standard computing needs, and might be further improved with replacement of 5400 rpm hard drive. The Altec Lansing speakers produce very clear sound and volume for an entry-level system and are placed in a smarter location than many laptops that place them on top where they collect dirt and other debris. Large display hinges feel solid. The unit doesn’t flex easily, and materials used in construction appear of good quality. If you need a cool laptop and do not want to spend ‘a lot of money’ this HP Pavilion G6-1B60US Charcoal Gray is the best choice for you. Nokia Lumia 900 4G is the first Windows Phone that supports LTE (4G Networks). Award-winning Best Phone on the CES 2012 event, it has proven that Lumia new series has many advantages and prepared to compete on the smartphone market. Nokia Lumia 900 technology which is also called the Nokia Ace has data transfer speeds at 50Mbps downlink and 25Mbps uplink. Nokia lumia 900 designs have a display size approximately 0.6 inch wider than the display nokia lumia 800 series. Nokia Lumia 900 is easy to use, looks and feels great. We can do everything that a smart phone needs to be able to do can read over my files that were loaded to Office 365 and even make some minor corrections. I’m familiar with iphone technology, but I notice that nokia ace is very easy to use for all my friends, who not a tech person. If you have a Life, the Nokia Lumia 900 is the perfect smartphone for you! I like the fact, that it will have cost me nothing after the $100 credit for me. HTC Rhyme Android smartphone features and reviews. Providing a smart, elegant unibody design with every detail carefully crafted to deliver a unique sensory experience, the Android-powered HTC Rhyme for Verizon Wireless attributes a fast 1 GHz processor and beautiful 3.7 inch multitouch display. In addition to Android, it additionally provides the next-generation HTC Sense interface experience, which includes faster business times from hibernation mode and a consolidated view of your favorite social networking websites. With the Android 2.3 Gingerbread operating system, you’ll get seamlessly integrated access to a a wide range of Google Mobile Services, including Gmail, YouTube, Google Look, and Google Maps, too as access to more than 250,000 apps available to download from Android Marketplace. This HTC Rhyme best smartphone comes with three accessories and so you can immediately set up your system. Whenever you open the box, you will find a pair of tangle-free headphones, a multifunctional docking station, and also a charm call indicator. The docking station wirelessly charges the telephone and activates Dock Mode, creating the HTC Rhyme Android smartphone a particular all-in-one alert clock, music player, as well as pic frame. The stylish Charm call indicator goes with anything, as well as it sits atop your bag and alerts we of incoming calls, missed calls, and also messages. The HTC Rhyme smartphone has a 5 megapixel rear camera that also captures HD 720p movie. Shoot professional-looking portraits with the Portrait scene, which makes skin look smoother with no significantly altering other components of the pic, or perhaps capture lifetime on a grand scale with the Panorama scene. When existence is in motion, savor it with slow-motion video or perhaps capture the most perfect moment with Action burst. This HTC 3.7 inch smartphone also includes a front-facing VGA camera for movie talk. Other features include Bluetooth for hands-free devices as well as stereo music streaming, included 8 GB microSD card (with expansion up to 32 GB via optional cards), GPS for navigation and also location-based services, full HTML browser with help for Adobe Flash, access to individual and business e-mail, and as much as 7.3 hours of talk time. Boasting the latest HTC experience, the Rhyme features a customizable active lockscreen that transforms the lockscreen into a real-time window to the most important information and also content, including social changes, pictures, weather or perhaps stock updates that tend to be viewed by simply waking up the display. Additionally, the unique active lockscreen becomes a customizable gateway that lets the quickly jump to your own most utilized features–whether it be creating a call, sending a particular email, or taking a pic. For illustration, the camera can be launched from the lock screen with a single motion, saving precious seconds when you are trying to capture the action. – HTC Rhyme consumer reviews can be read by clicking the image on the right side of the product specifications and features. That’s information about smartphone reviews and smartphone features of the HTC Rhyme smartphone. >> Click here for more information or to buy cheap HTC Rhyme smartphone. At just 9.3mm, the iPhone 4 is thin as a rake but the front and back are 30 times stronger than the usual plastic. Reason – aluminosilicate glass, the stuff that windshields of military choppers are made of. When you become a shutterbug behind the iPhone 4 camera, you shoot 5 megapixel images and high-definition videos at 720p resolution, with the LED flash and autofocus, that make things easier. Opt for the iMovie video editing software, and you become a movie maker. If you happen to have Wi-Fi around, the FaceTime feature gets you into true worldwide video chat and ‘staying in touch’ becomes real personal. And all it takes to choose between the front and rear camera is a tap. The Retina Display packs in 4 times the amount of pixels (326 per inch) of iPhone 3, and makes the text and images slicing sharp. The periphery is customized alloy, 5 times stronger than steel. Your accidental dropping won’t hurt the world’s thinnest smartphone. The 3-axis gyro, when coupled with accelerometer, results in 6-axis motion sensing, and that’s as good as it can ever get for gaming on a cell phone. 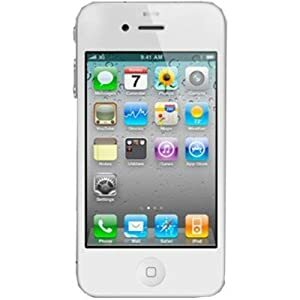 With 7 hours of talk time (3G)/10 hours of video/40 hours of video, the iPhone 4 packs in enough power to let you do fast multitasking and then some more – there are over a 100 new features thrown in. iOS5, great camera, gorgeous, unlimited data (Sprint), retina display, tons of accessories available. 8 GB is not much for music, video, and app lovers. No memory expansion option. Some might want a bigger screen. It won’t talk back. No native turn by turn directions (must buy paid apps). Logitech G19 Gaming Keyboard comes with solid key’s design and on board media player. The color game-panel LCD gives you great multiple profiles and arsenal of advanced gaming technology. It is the first Logitech keyboard series that featured by a 320 x 240 pixel color Game-Panel LCD. Its bright and clear to read in the dark. 3. Two high-speed USB 2.0 port for makes easier to locate than the previous series. 4. Multi-Keys Input with fully programmable G-keys. 5. The keys have a nice clean feel and layout. 7. Perfect volume control with scroll. Yo need an AC adapter. If you take your game play seriously, you should have the Logitech G19 keyboard on your side. Overall, Logitech G19 is an awesome gaming keyboard, although you’re not a gamer. Click here for the special discount and more detail information.